The Guradian yesterday released a survey by Public Policy Polling which indicates that Ameircans may be more concerned about the National Security Agencies digital dragnet than polling results reported earlier suggest. PPP polls are generally reliable and target voters, which may explain some of the variations in attitudes. Of course different questions were being answered, too. 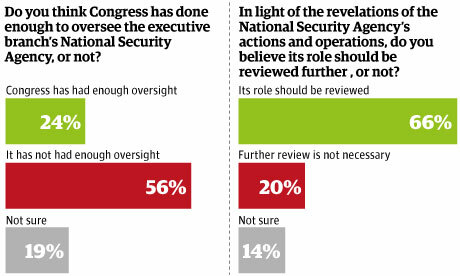 Two-thirds of the voters surveyed want NSA surveillance activities reviewed; 56 percent want greater congressional oversight. Sixty percent want the government to open up about its data collection programs to understand what’s going on; 61 percent welcome fresh debate about the balance between security and privacy. PPP also found a major (58%) concern about the role of private contractors’ access to state secrets. Voters are pretty evenly split on whether they approve of the government’s collection of their personal phone and internet data. Other reports, in the Guardian and elsewhere, show Snowden playing a skillful yet very dangerous game. Some have questioned his choice of Hong Kong to make his stand. He seems to have the US government in a Catch 22: If he is charged and extradited, Hong Kong police must arrest him, seize his files and computers; and hand them over to the Chinese government, which the US may want to avoid.